Maxi skirts have taken a big step in the fashion world this summer ! They look very chic and are perfect for the summer ! They are very popular right now- i spot them on racks everywhere i go! 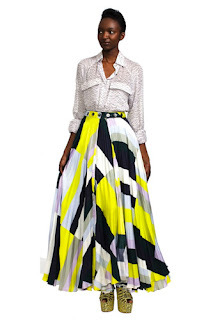 But be aware that maxi skirts are not something that you can put on and walk out of the house in… these long length skirts make a younger teens look much older. Yes, its perfect if you are aiming for a more mature look but who wants to look old now days ! ha ha. So i would advice that you think twice before buying a maxi, The top is equally important, you have to have a top complements the skirt- if it goes wrong you might just look like a kinder garden teacher! It mostly suits thin and tall people but you never know,It might just turn into one of your favs !